This EA had been tested and optimized it for more than 1 year on real account. Many skilled traders give their suggestions on this EA optimization. Thanks to them. The EA automatically loads different parameters for different pairs. 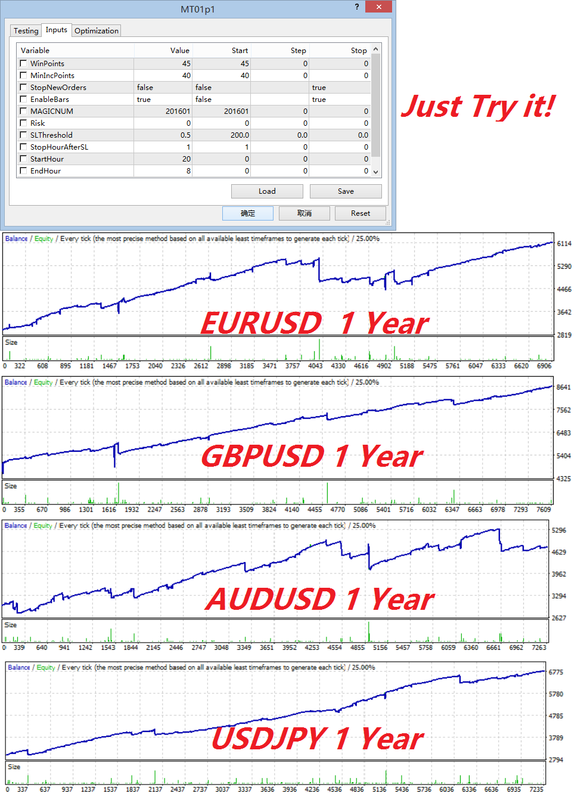 The optimized and verified pairs include: EURUSD, AUDUSD, USDJPY, NZDUSD, EURAUD, GBPUSD. Suggested run on M1 or M5. This tool can help you manage your orders. It can help you calculate the average cost of all your orders and set the same TP value for the orders. It can open new orders, as well as calculate and set the same new TP value for all the orders. This tool Protects your account from blowing. When the drawdown reaches the specified value, all orders will be closed. According to many indicators to find the turning point and open the first order. If the market goes against the first order, martingale rules are followed. This EA is tested on real account for a long time and optimized for many scenarios, making the trading risk very low. EURUSD, AUDUSD, USDJPY, NZDUSD, EURJPY, AUDJPY, NZDJPY, EURAUD. 20% SL happened. I have added the account to $2000. 20% SL happened. I have added the account to $1000. Which one EA products from this signal you use? This is a auto-trading program based on Martingale strategy. The basic idea of this strategy is to add more lots when the market moves on the contrary direction after the first order. Once the market direction reverses, it is able to get profit. Many people think the Martingale is not a good strategy, and even some platforms prohibit such trading. But, as I known,trading based on Martingale can help you make money if you know how to operate. Because the market always reverses! Only trade during Asian time . Better profit, low risk on multi pairs. Try it! Use the param as the pic. More possibility is up to you!